You'll be £12.79 closer to your next £10.00 credit when you purchase The Battle of Okinawa 1945. What's this? The American campaign to capture Okinawa, codename Operation ICEBERG was fought from 1 April to 22 June 1945. 350 miles from Japan, Okinawa was intended to be the staging area for the Allied invasion of the Japanese mainland. The Japanese Thirty Second Army defenders were on land and the Imperial Navy at sea fought tenaciously. They faced the US Tenth Army, comprising the US Army XXIV Corps and the US Marines’ III Amphibious Corps. 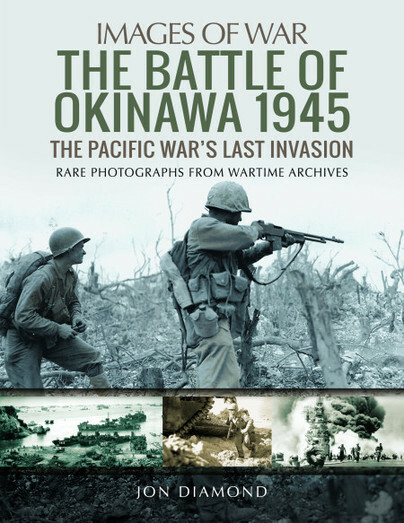 As the author of this superb Images of War book describes in words and pictures this was one of the most bitterly fought and costly campaigns of the Second World War. Ground troops faced an enemy whose vocabulary did not include ‘surrender’ and at sea the US Fifth Fleet, supported by elements of the Royal Navy, had to contend with kamikaze (‘divine wind’) attacks by suicide air attacks and over 700 explosive laden suicide boats. The Okinawa campaign is synonymous with American courage and determination to defeat a formidably ruthless enemy. The campaign was the subject of ‘Hacksaw Ridge’ , the recent Hollywood blockbuster – this is the real story. Another beautiful photo book from Pen & Sword! Jon Diamond MD is a kidney specialist in the UK with a deep interest in the Second World War. He is a keen collector of photographs. His Stilwell and the Chindits and War in the South Pacific are published by Pen and Sword in their Images of War series.